Who is Hasan Sheikh Mahmoud? And is Somalia capable of turning a new leaf? 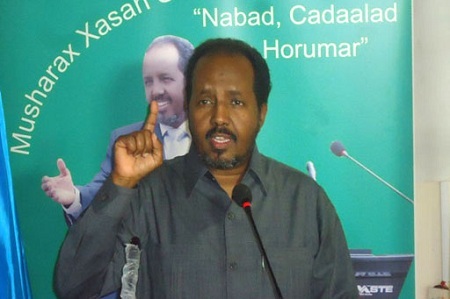 Somalia has a new president today — Hasan Sheikh Mahmoud (pictured above) — after his election by Somalia’s new parliament, which itself was sworn in just last month. Mamhoud defeated current president Sheikh Sharif Ahmed in the second round of voting — although the incumbent won the first round of voting, Mamhoud finished a close second, defeating prime minister Abdiweli Mohamed Ali, who came in third. And, more importantly, can he succeed where 15 prior transitional governments have failed in reviving a country that vies as perhaps the world’s most infamous failed state? Mahmoud, and academic and a civic activist, speaks both Somali and English, has worked for the United Nations Children’s Fund in Somalia from 1993 until 1995, and he co-founded the Somali Institute of Management and Administration Development in Mogadishu, the country’s capital, in 1999. Last year, he formed the Peace and Development Party. Allegations of bribery (among all factions) are already marring Mahmoud’s victory, but the fact that the vote even took place is perhaps itself the bigger victory for a country that’s effectively been without a government for over two decades– Somalia descended into anarchy and clan-based fighting after the fall of Mohamed Siad Barre in 1991, who had ruled the country since 1969. Recently, a UN-backed transitional roadmap, reinforced by the African Union, has prompted some hope that Somalia may have reached a transition point — the roadmap led to the current political process, and last year, AU and other regional forces ended fighting in Mogadishu. Although al Shabaab and other militants have been swept from the capital, ending years of street-battle violence, Islamic militants still control much of the rest of the center and south of Somalia. Al Shabaab (Islamic for “the youth,” it formed in 2006 as a radical spinoff from Somalia’s main Islamist group, the Union of Islamic Courts, and is now affiliated with al Qaeda). Despite the gains, Mahmoud and the Somali parliament have a very long road ahead in regard to gaining control in Somalia and securing the entire country, to say nothing of other pressing needs for infrastructure and economic development. Mahmoud’s legislative counterpart, Mohamed Osman Jawari, who was appointed speaker of the federal parliament on August 28, is also an English-speaking academic and an attorney by occupation. Jawari served briefly as the minister of transportation and as minister of labor and sports in the Siad Barre regime, and he lived in Norway in exile after civil war broke out in 1991.